My latest For the Birds column releases my personal top 10 birding moments for 2018. Recapping the previous year is my favorite column to write each late December or early January. This year, instead of blasting out the top 10 all at once I’m going to spread it out and reveal two each day, starting today (Jan. 1, 2019.) This post will include Nos. 8 and 7. 8. First New England northern bobwhite. I saw one of these ground birds in Delaware many many years ago, but I finally got my first New England sighting this fall. It is a species in serious decline and would be nice to see them thriving again. Black-capped chickadee clearing out cavity for nest. 7. Breeding Atlas. 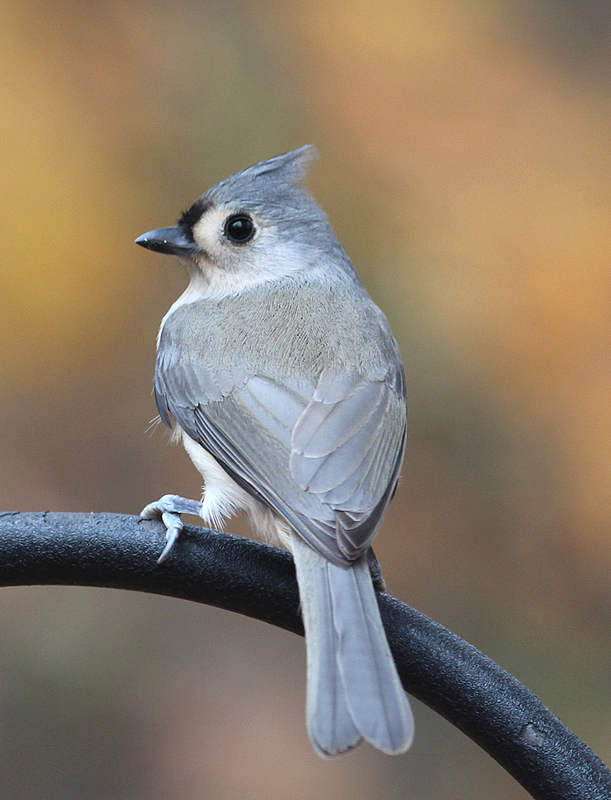 Connecticut is undergoing an ambitious three-year survey of its breeding birds. The state is divided into more than 100 blocks that are covered by volunteers. My block features lakes, marshes, mountains, and woods. Photo by Chris Bosak A purple finch eats seeds at a feeder in New England, Nov. 2018. There has been a lot of talk lately about winter finches. There usually is this time of year. I have read accounts of people seeing big flocks of pine siskins. Siskins are probably the most common winter finch that irrupts into the middle and southern parts of New England sporadically in winter. Winter finch is not an official term with a clear-cut number of species that nicely fits the category. Rather, it is a general term used for members of the finch family that breed up north and typically spend their winters up north, but irregularly move south during the winter as food sources dictate. The species most commonly associated with a winter finch irruption include pine siskin, common redpoll and purple finch. Larger finches, such as pine grosbeak and evening grosbeak, are also species seen at backyard feeders throughout New England during the winter. But birds do not even have to be finches to fall into the loose category of “winter finch.” Often, the red-breasted nuthatch is lumped into the category due to its great abundance at feeders some winters and being a no-show during other winters. So far this winter I have seen a lone female purple finch at my backyard feeding station. That has been the extent of my winter finch season so far. The nature of a winter finch irruption, however, could mean a sizable flock of pine siskins can show up and empty out my Nyjer seed feeder at any moment. I did see a few red-breasted nuthatches on a recent trip to northern New Hampshire, but that is part of their breeding and winter grounds, and would not fall into the category of a winter-finch sighting. Admittedly, it took a minute or two to identify the female purple finch that has been visiting my yard. It was clearly something different, so I knew I had to lock down an ID as soon as possible. Female purple finches are streaky brown in plumage. It didn’t have the look or feel of a sparrow, so I eliminated those possibilities immediately. It looked a lot like a house finch, but was more heavily streaked and slightly larger and plumper overall. The thick bill further eliminated any sparrow possibilities and after very briefly considering the female rose-breasted grosbeak, I was able to nail down the ID as a female purple finch. In the past when I have seen purple finches, it has usually been a pair so getting an ID was easier because I had the more colorful male to observe. For whatever reason, regardless of how great a winter finch season it is throughout New England, my yard typically does not drive in a lot of these birds. While I’ve read about several backyards being ambushed by pine siskins already this season, I haven’t seen a pine siskin in about 10 years. That species typically irrupts every three or four years. If nothing else shows up at my feeders all winter, I still have my regular feeder birds and my female purple finch. And I’m good with that. A Tufted Timouse perches near a feeding station in New England, fall 2015. February may be a few weeks away, but there’s no harm in being prepared for what’s in store. February is a big month in the birdwatching world. It’s a cold month in the middle of winter, but a little birding and bird feeding will help make the cold more tolerable. First of all, February is National Bird Feeding Month. I don’t normally get too excited about national this month or that, but I’ll celebrate anything that gives me an excuse to do more birdwatching. National Bird Feeding Month was first proclaimed in 1994. Also, February is always the month of the Great Backyard Bird Count. I’ll write more about this citizen science project in a later column, but just so you can mark your calendars, this year it will be held the weekend of Feb. 12-15. For now, in honor of National Bird Feeding Month, here are a few tips on how to attract birds to your yard in the typically cold month of February. Suet is a must. Whether you use pre-packaged suet cakes or make your own out of beef fat (the store-bought cakes are much, much easier), suet should be an offering in the winter. I can count on one hand the number of minutes a bird is not at my suet feeder. Usually it’s a Downy Woodpecker, but also seen are Hairy Woodpeckers, Red-breasted Woodpeckers, White-breasted Nuthatches, and Carolina Wrens. 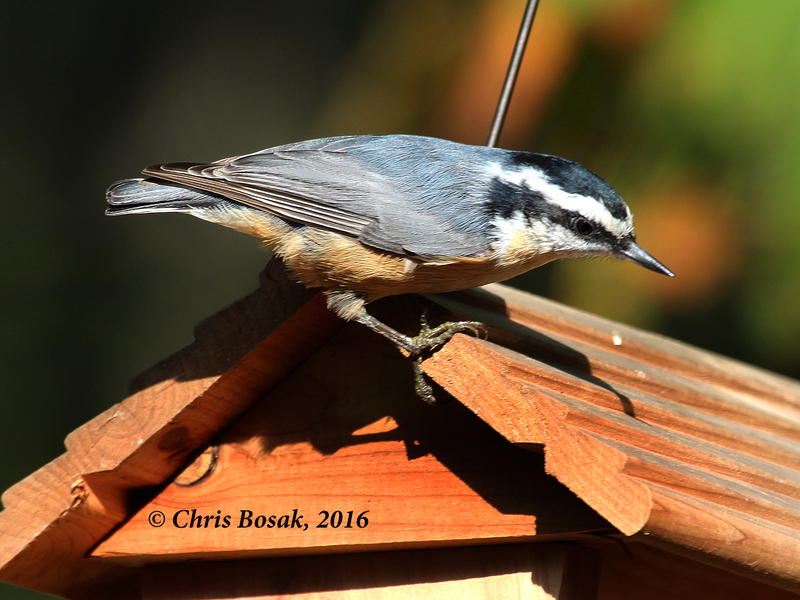 Occasionally, chickadees and titmice visit the suet as well. For the Birds column: Another big Snowy Owl irruption year? 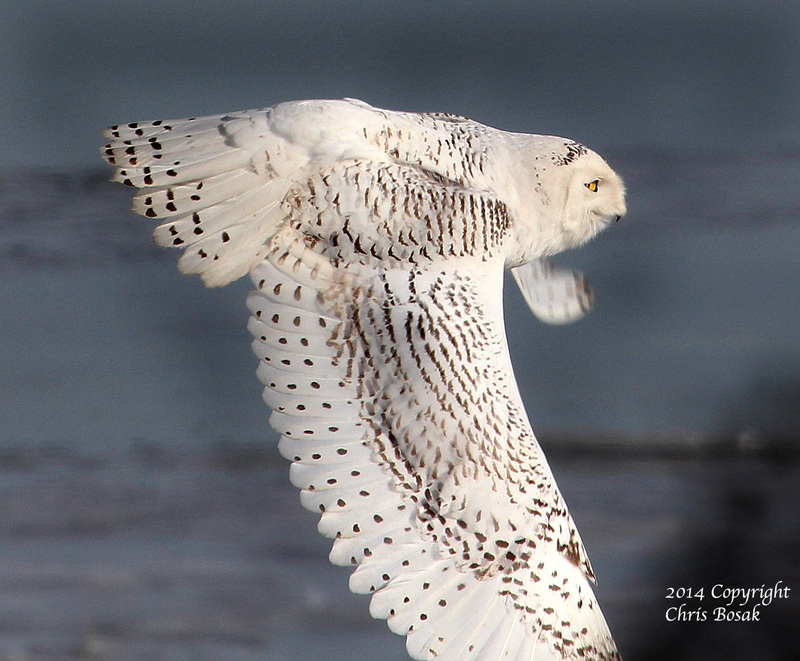 A Snowy Owl flies across the beach at The Coastal Center at Milford Point in early March 2014. The historic Snowy Owl irruption of the 2013-14 winter is still fresh in many people’s minds. I know it’s still on the top of my mind. Could we be in store for another one this winter? We’ll have to wait and see, of course, but if what is happening in Minnesota, Wisconsin and Michigan already is any indication, the chances are pretty good. We’ve barely turned the calendar over to November and sightings in those states are booming. Typically it is mid to late November when the Snowy Owls start showing up. The Snowy Owl that delighted hundreds of visitors at Calf Pasture Beach in 2008, however, showed up in early November. This year the sightings in the Midwest came even earlier, starting as early as Oct. 20, according to the folks at eBird. eBird is an online database of bird sightings with much of the data submitted by citizen scientists.